As soon as she arrives, Gail clashes with Diana, the leader of the school’s most powerful clique. The Winged make Gail’s life hell until she find allies: her airhead roommate; a cowardly fellow victim of the Winged; and, bit by bit, Diana’s boyfriend–the seemingly heartless Nick. But Gail soon has bigger problems than Diana. One of her teachers hates her. Glasses shatter and fountains erupt around her. She can’t swear no matter how hard she tries. An unseen force is keeping her on campus. Worst of all, she uncovers a plot that will give one person a precious gift at the cost of thousands of lives. Now Gail and her friends must stop the plot–not just to save lives, but to win a brain, the nerve, a heart and a home. Where do you find your inspiration? From my family and my life experiences. 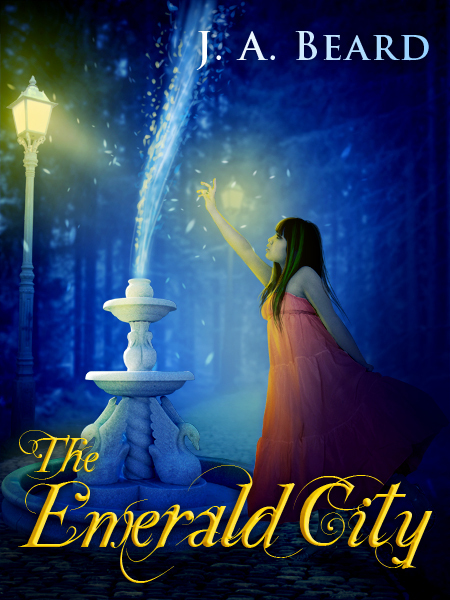 What is your favourite aspect of THE EMERALD CITY? The characters. Who is your favourite character from THE EMERALD CITY and why? Gail. She’s tough and snarky, but she cares about others. What do you love about most about writing? Being able to vent my built-up creativity. J.A. Beard likes to describe himself as a restless soul married to an equally restless soul. His two children are too young yet to discuss whether or not they are restless souls, but he’s betting on it. He likes to call himself the Pie Master, yet is too cowardly to prove his skills in an actual baking competition. So, really, he’s merely a Potential Pie Master. This entry was posted in Events, May 2012 - Indie Author Event and tagged author bio, buying links, interview, JA Beard, the emerald city, website. Bookmark the permalink. Oooh – regency AND paranormal? That next one sounds really interesting, too!